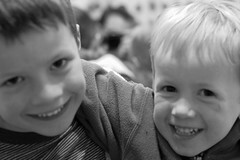 Tried, rather in vain last night, to get a brotherly shot of the boys with the 50mm lens. Since it's manual focus, I'm left to hoping that they don't jerk around too much when I've got the aperture wide open. Nevertheless, the expressions are pretty cute. A couple of the other shots had slightly better focus, but I couldn't get enough separation between them to get me in the mirror reflection. I'll take it as a good sign that they wanted to be so close. The others are here and here. How do you like the 50 mm? I'm toying with getting a new lens, but I'm not sure what direction to go in. And congrats on the soon-to-be new addition. We are 3 and a half months into three kids and its...fun. Yeah, fun. There's never ANY talk of running away to another country and changing my name.